Explanations: The consolidation in Corporate Accounting Assignment is done by adding both the companies figure. The loan given to Mille Ltd by Max Ltd is not taken into account. The dividend declared by mile prior to acquisition is not taken into account but after the acquisition, it is counted (www.pwc.com, 2014). For inadequate data the acquisition analysis and changes in equity are not done. 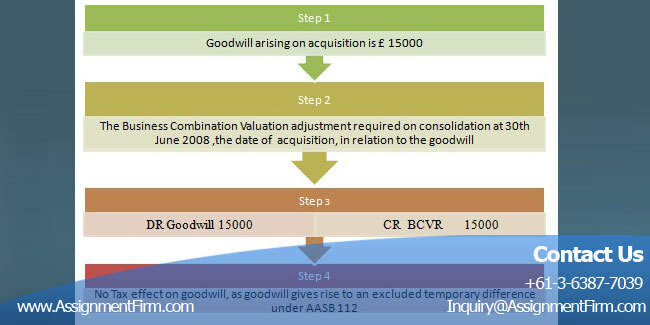 However, for acquisition analysis, the tangible asset, intangible asset, non-controlling interest, consideration paid, goodwill or bargain purchase gain is measured. The valuation entries, pre-acquisition transactions and the intra-group transactions are done over consolidated worksheet but not on the records of the subsidiary in Corporate Accounting Assignment. One pictorial representation of BCVR adjustment is given below. The contingent liability and intangible assets should be recognised to full amount of fair values if they can be reliably measured. They are recognised on consolidation, but not on subsidiaries books. DR Asset CR BCVR CR DTL is the form of existing asset recognition. Contingent liability recognition should be in the form of DR BCVR DR Deferred Tax Asset (DTA) CR Contingent Liability. 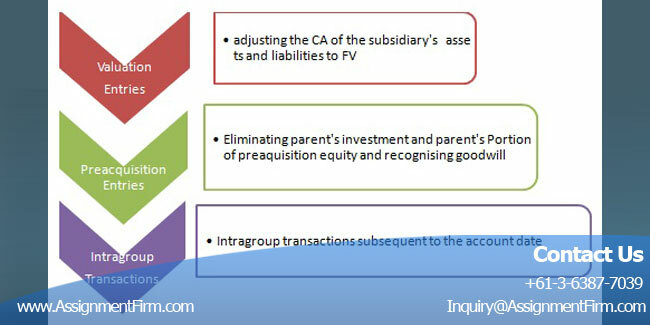 At the acquisition date, the equity balances the assets, liabilities and contingent liabilities. The opening retained profit, the share capital and the other reserves with BCVR are pertinent only if the acquisition is at the starting of the acquisition. Pre-acquisition equity balances should be eliminated from investment and post acquisition profits and reserves should be consolidated. The dividend are payable to the parent as the new owner of the share. The dividend receivable acquired by the parent is excluded from the cost of the combination. At acquisition date the consolidation should eliminate the dividend receivable and dividend payable between the parent and subsidiary (Deans, 2011). DR General reserve £ 20000 will be included in the PAE for consolidation. The PAE for consolidation includes the DR Transfer General Reserve £ 20000 when the transfer is in the current period. The PAE considers the DR Retained Earnings (Opening) £ 20000 when the transfer is in the previous period. The carrying amount of the pre-acquisition profits and investments of the subsidiary are reduced. In the subsidiaries books which are a dividend, that is ROI to the parent. In preparing a consolidated statement of cash flows, amounts included in respect of the economic entity, especially in relation to subsidiaries entering or leaving the economic entity, shall be determined in accordance with the standards AASB 1024.